Water molecules have unusual chemical and physical properties. Water can exist in all three states of matter at the same time: liquid, gas, and solid. Imagine that you’re sitting in your hot tub (filled with liquid water) watching the steam (gas) rise from the surface as you enjoy a cold drink from a glass filled with ice (solid) cubes. Very few other chemical substances can exist in all these physical states in this close of a temperature range. In the solid state, the particles of matter are usually much closer together than they are in the liquid state. So if you put a solid into its corresponding liquid, it sinks. But this is not true of water. Its solid state is less dense than its liquid state, so it floats. Water’s boiling point is unusually high. Other compounds similar in weight to water have a much lower boiling point. Another unique property of water is its ability to dissolve a large variety of chemical substances. It dissolves salts and other ionic compounds, as well as polar covalent compounds such as alcohols and organic acids. Water is sometimes called the universal solvent because it can dissolve so many things. It can also absorb a large amount of heat, which allows large bodies of water to help moderate the temperature on earth. Water has many unusual properties because of its polar covalent bonds. Oxygen has a larger electronegativity than hydrogen, so the electron pairs are pulled in closer to the oxygen atom, giving it a partial negative charge. Subsequently, both of the hydrogen atoms take on a partial positive charge. 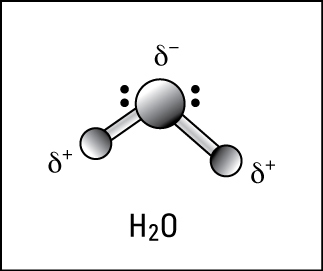 The partial charges on the atoms created by the polar covalent bonds in water are shown in the following figure. Polar covalent bonding in water. Water is a dipole and acts like a magnet, with the oxygen end having a negative charge and the hydrogen end having a positive charge. These charged ends can attract other water molecules. This attraction between the molecules is an intermolecular force (force between different molecules). London force (or dispersion force). This weak type of attraction generally occurs between nonpolar covalent molecules, such as nitrogen, hydrogen, or methane. It results from the ebb and flow of the electron orbitals, giving a weak and brief charge separation around the bond. Weak dipole-dipole interaction. This intermolecular force occurs when the positive end of one dipole molecule is attracted to the negative end of another dipole molecule. It’s much stronger than a London force, but it’s still pretty weak. Extremely strong dipole-dipole interaction. This force occurs when a hydrogen atom is bonded to one of three extremely electronegative elements — O, N, or F. These three elements have a very strong attraction for the bonding pair of electrons, so the atoms involved in the bond take on a large amount of partial charge. This bond turns out to be highly polar — and the higher the polarity, the more effective the bond. When the O, N, or F on one molecule attracts the hydrogen of another molecule, the dipole-dipole interaction is very strong. This strong interaction is called a hydrogen bond. 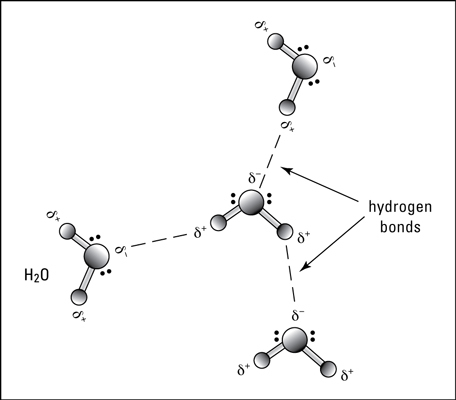 The hydrogen bond is the type of interaction that’s present in water, as shown in the following illustration. Water molecules are stabilized by these hydrogen bonds, so breaking up (separating) the molecules is very hard. The hydrogen bonds account for water’s high boiling point and ability to absorb heat. When water freezes, the hydrogen bonds lock water into an open framework that includes a lot of empty space. In liquid water, the molecules can get a little closer to each other, but when the solid forms, the hydrogen bonds result in a structure that contains large holes. The holes increase the volume and decrease the density. This process explains why the density of ice is less than that of liquid water (the reason ice floats). 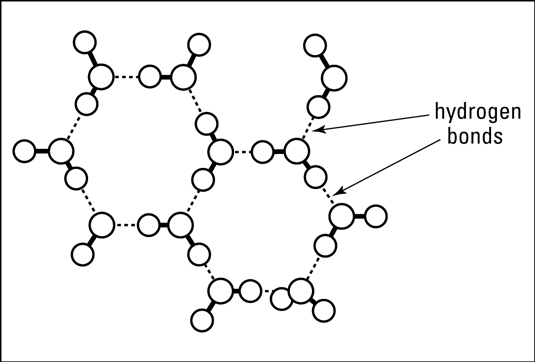 The structure of ice is shown below, with the hydrogen bonds indicated by dotted lines.